Dottys Teahouse is a fast-growing, family run business with several locations, with HQ and the heartbeat of the business being based in Carshalton in Surrey! We are always on the lookout for likeminded, passionate and enthusiastic individuals to join our friendly team so please get in touch, we’d love to hear from you! 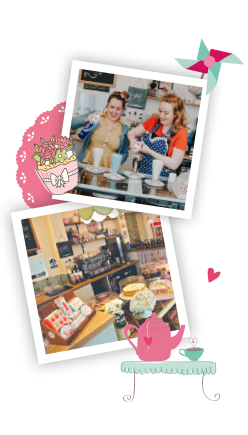 Dottys Teahouse is a vintage style, quintessentially British tearoom, cake shop and afternoon tea venue situated in the lovely village of Carshalton. passionate people to join our fantastic team. at every step of their development within the business. decadent experiences for all our guests whatever the weather. are keen to shine in our dynamic team at Dotty’s. 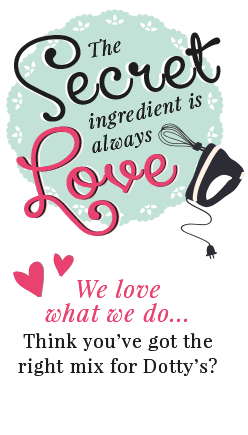 Even if a specific role is not advertised and you have experience as either a chef, cake decorator, kitchen porter, administrator, in customer service or front of house, we would love to hear from you! Simply send you CV with a speculative job application email to EMAIL US. Should your application be of interest to us we will get in touch as soon as a suitable position becomes available. Love Dotty's and want to work with us? Even if a specific role is not advertised and you have experience as either a chef, cake decorator, kitchen porter, administrator, in customer service or front of house, we would love to hear from you! Upload your CV along with a covering note. I love Dotty's - please consider me! In 150 words please let us know a little more about you and what you have to offer Dotty's. Where would a teahouse be without its chef? Our Kitchen Team Members are the maestros behind the sweet and savoury goodies that fill our afternoon tea and cake stands. All of our food is made to order so the ability to work under pressure and to time constraints is a must. If you love freshly made sandwiches, cakes, parties and sweet treats as much as we do and can keep up with the demands of our busy Teahouse, we might just have an apron with your name on it! Our Teahouse cannot run without the support of a complete team and everyone plays a vital role from kitchen porters through to managers. The Assistant Manager is available to support and work alongside the Branch Manager to help run the Teahouse but is also able to lead and inspire. You will set high standards, uniting and spurring on the kitchen and front of house to create and serve our lovely customers. Good interpersonal skills with the ability to build effective working relationships and to work collaboratively with colleagues at all levels. Do you have what it takes to make Dottys Teahouse a great place? The first thing to greet our customers, aside from a tempting array cakes, is our friendly Front of House team. We want every visitor to our Teahouse to leave wanting a second taste of what Dottys has to offer and this requires the dedication of outstanding individuals with a passion for our products.